One of the biggest challenges with OS Deployment is keeping track of all the different deployments and everything that changed between the deployments. This post will focus on the first part, keeping track of all the different deployments. I will do that by showing a way to write information to the registry, creating a hardware inventory for those registry keys and building a report on the inventory data. 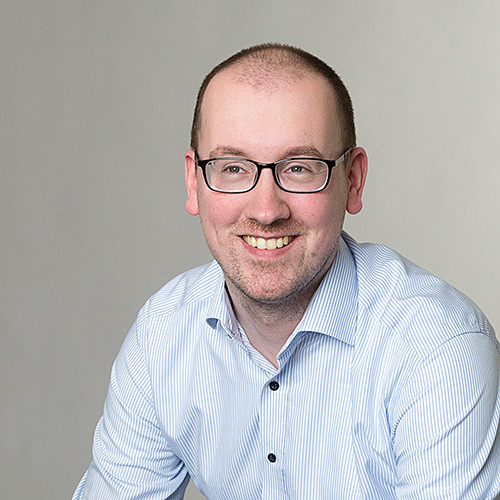 For the second part, keeping track of all the changes, take a look at this great post of Maik Koster. Now to run this script, save it as a vbs file and add it to a package. 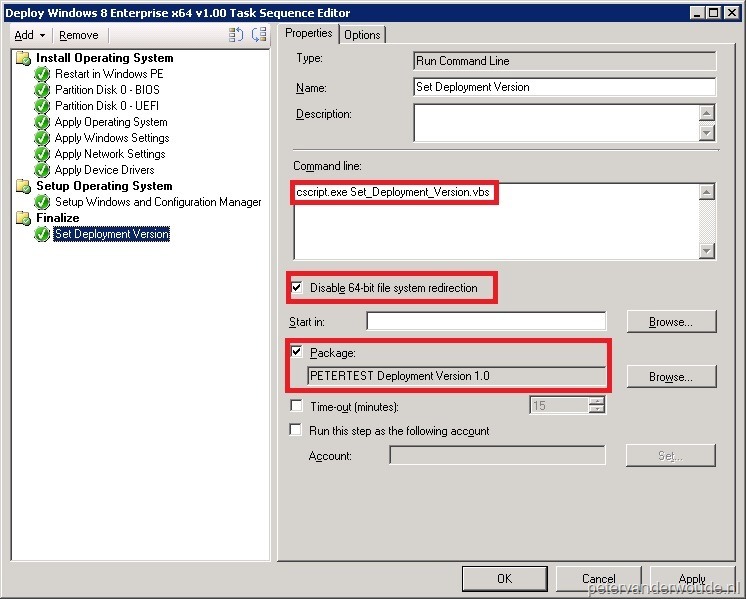 In the task sequence (see picture) add a Run Command Line –step, select Package and Browse to the package with the new script. In the Command line add cscript.exe <ScriptName> and select Disable 64-bit file system redirection. This last action makes sure that the registry information will be written to the same key on all systems, so there is no need for multiple inventory classes. The second thing is to create a hardware inventory for the newly created registry keys. There are two ways to do this. The first one is to create our own extensions and the second one is to use the tool RegKeyToMof. I choose to use the second way, as that tool makes my life a whole lot easier. On a computer, which has run the task sequence, open the tool RegKeyToMOFv31 and browse in the top screen to the new registry key. In the bottom screen it will now show the necessary extensions for the different MOF files. Also fill in a good Class Name (I use DeploymentVersion), as this will also be part of the table and view names in the database. Now open the Configuration Manager Console and navigate to Administration > Client Settings. 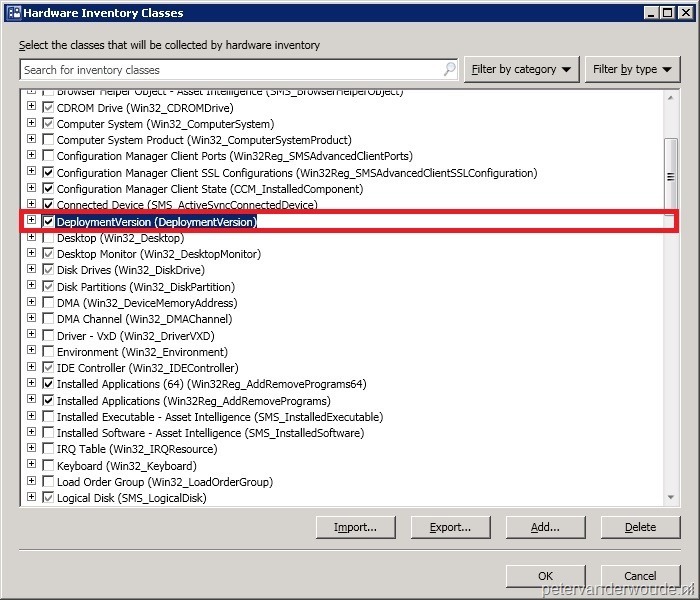 Open (for example) the Default Client Settings, go to Hardware Inventory and click Set Classes. In the Hardware Inventory Classes, click Import and Open the new (temporary) MOF file. This will show the new class for the inventory. Now to put all the pieces together, open SQL Server Report Builder 3.0 and create a new report. 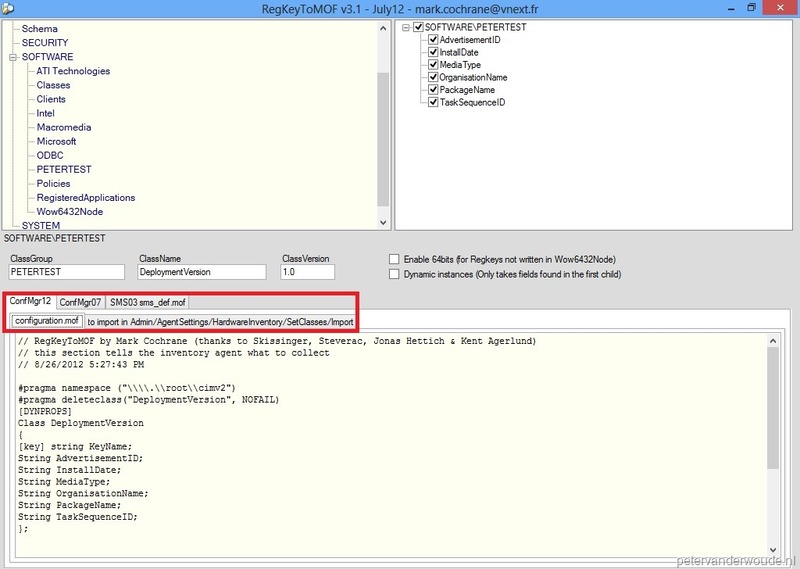 Add a Data Source to the ConfigMgr database and create a DataSet with the previously mentioned query. The last things to do is add a table to report, add the necessary fields and save the report between the other ConfigMgr Reports. Open the Configuration Manager Console, navigate to Monitoring > Overview > Reporting > Reports and that’s where the new report will show up. 0X80041002 Class, instance, or property ‘SMS_Class_Template’ was not found. Was this all done on the server? Was there any other steps you needed that are associated to the SMS_Class_Template? I run the RegKeyToMof tool a machine with the registrykeys that I need and everything I did is described in the post. In RegKeyToMOF under ConfigMgr12 there are two tabs, one is configuration.mof and two is to import in Admin/AgentSettings/HardwareInventory/SetClasses/Import. So going to the second tab will give you the information needed for that. I’d appreciate any thoughts you have? That error code doesn’t directly trigger any ideas with me… You’ve got some more information about how you tested and configured it? I have created a package, with the vbs script copied from the above and ran it at the end of the TS with the same setup as you have. As the script is pretty straight forward, I can only imagine that something went wrong with copying and pasting the code. I just noticed it myself too that a copy-paste action from my blog to notepad just screws up the quotes, both single (‘) and double (“). Also try to test run it from a task sequence environment (either by pausing a task sequence, or when a task sequence failed) to gets some more feedback. Hi Peter, I’ve tried it again and ran it after pausing the TS – it gives me line 4, char 31 error invalid character. Would it be possible for you to email me the script as it should be? Appreciate your help with this. I just sent the script via the mail. I had some problems with this procedure as I was trying to edit custom client settings rather than the default client settings, once I did that everything worked fine. Thank you for this write up Peter, very useful info. Hi Peter, how are you doing today? I would like to thank you for your script and for the step-by-step for the report. I got the script working fine, I get all the keys, etc. For the MOF file, all good as well, could add the configuration.MOF on my SCCM server normally. I also imported the custom.MOF file with the results from the RegtoMOT tool. all good. My Only issue is in the SQL Server (Report creation part). I am not a SQL person, and I cant figure out how to do the SQL part in order to create the Tables, etc. Would you be able to detail a little bit on the very last part when it says: (Add a Data Source to the ConfigMgr database and create a DataSet with the previously mentioned query. The last things to do is add a table to report, add the necessary fields and save the report between the other ConfigMgr Reports. ). I’m not sure which steps you want to have more detailed. When you open the Report Builder, for a new blank report, all the mentioned items are on the left. Hi Peter, how are you? thank you for your reply to my question. I have a question for you. When I run the query against my SQL DB, I got somehow all computers on my SCCM DB, instead of only the ones I have deployed so far and I also get all columms with NULL values. I think that related to the type of join that you use. In this case you should use a left outer join, if I’m not mistaken. Please try and let me know. Great article, helped out a lot. I’m a bit fuzzy on the last steps though, was wondering if you could email me the .rdl file to import for the report. I’ve created the datasets and just need to add the table, but not sure what fields to add. I’m sorry, but I don’t have that report in my current lab. However, it shouldn’t be to difficult. It should be pretty straight forward with the notes after the SQL query. If not, please let me know which part is difficult to understand.